I have been immersed in my “other life” for the past four weeks, and have neglected everything else except learning lines, blocking and finding characters for the multiple roles I (and my acting partner) play in Harvest, a sweet play for two “mature” actors, by Canadian playwright, Ken Cameron. Although all kinds of misadventures happen to Allan and Charlotte (our two main characters) in the story, including moving to the city, retirement downsizing, having their home being turned into a marijuana grow-op by renters, it really is, at its heart, a story of two people who have been married for forty-two years … and who need a jolt to remember why they love each other. As we approached Opening Night for this play, set in the countryside and specifically a raspberry patch, I wanted to make something a little special in the chocolate line to express my thanks to everyone involved. It takes a lot of folks to put on what is really a very intimate little play. Our set designer, Laughlin, has built us a true-to-life raspberry patch (complete with thorns, as my fingers can attest to! ), and in a couple of scenes I dig in the soil and pick berries. The ones we use in the show are Swedish Red Berries, but I can’t eat ‘em (too gummy when you have to speak fast dialogue). Those scenes always make me salivate for the taste of real berries. As we are just coming out of a chilly Vancouver winter, there are obviously no fresh raspberries to be found, but I did have the good fortune to acquire a flat or two of gorgeous ones at the height of the season last summer, and froze them for use, year round. I have an idea of a dark chocolate ganache, infused with raspberry, enrobed in milk chocolate, with a tiny red cocoa butter transfer sheet heart on top. 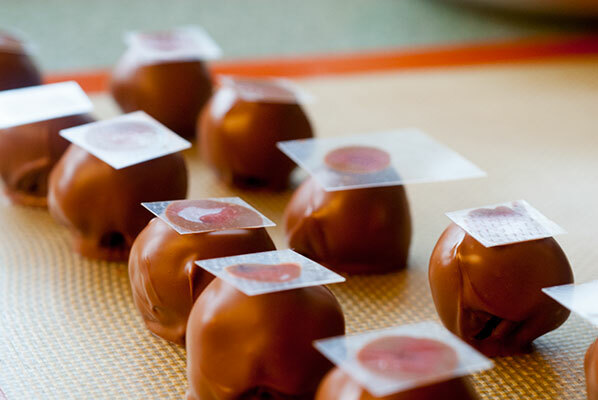 I go back to my Ecole Chocolat notes on ganache, and especially the section on using fruit purees. 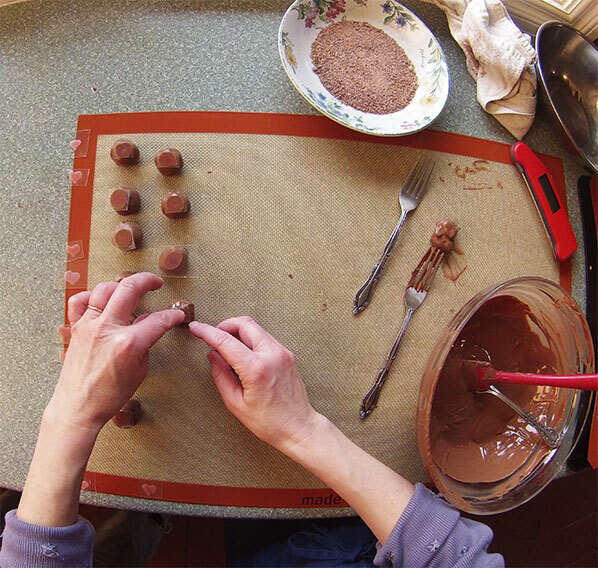 I love making ganache with beacuop de friction and multiple tiny additions of hot cream. Previously, I have made cold infusions, steeping earl grey tea or lavender in cold heavy cream, overnight, with great success, but this time, since I am going to be using a raspberry puree, I will need to take its volume into account, and adjust the amount of cream accordingly. I make the ganache, using a ratio of 16 ounces (1 pound/454 grams) good dark chocolate, to 6 ounces heavy cream, and 6 ounces raspberries, frozen then thawed. And this is where I got myself into trouble: I treated the raspberries as a solid add-in. I melted the chocolate on half power, until 70% melted, while gently heating the cream, until small bubbles formed around the edge of the liquid. 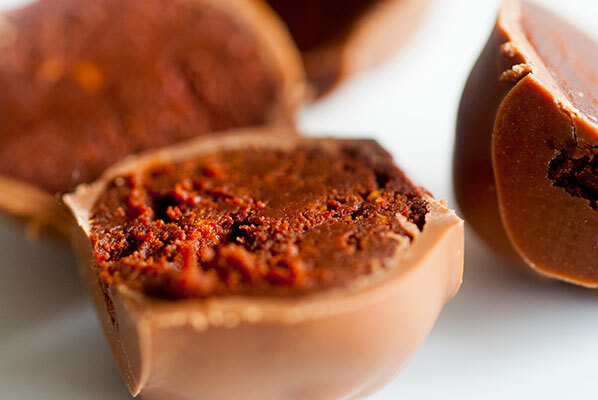 I had to get in to rehearsal, and had only a half hour before I had to leave, and wanted to get the truffle centres finished, so they could rest for a day before enrobing … so I was rushing, I confess. 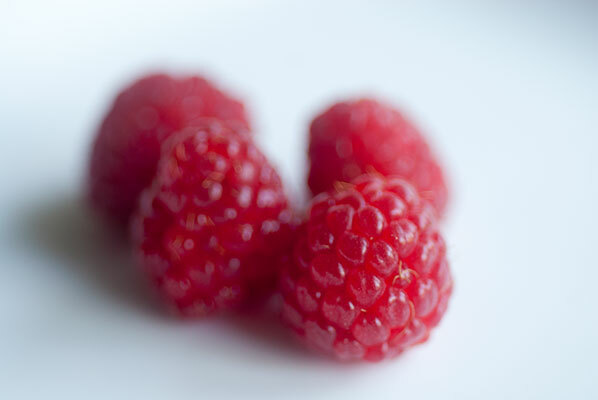 Humming a merry tune, I grabbed the bowl of raspberries, which I had mashed with a fork, as they thawed. I had wanted to keep the raspberry seeds in, because I actually like their texture, and had little bits of ruby red pulp remaining. It also, as it turns out, had little bits of frost clinging to them, and their temperature was chilly, which I should have realized as I lifted the bowl, but didn’t. I tossed the raspberries into the ganache … causing the whole thing to seize, immediately. Almost weeping, I frantically beat the mixture with my silicone spatula. Oh, it was stiff. And sort of crumbly. Chef Fred (who I idolize from Valrhona’s series of ganache tutorial videos) would be very disappointed – I would not blame him for calling me “un idiote!” Actually, there is a story that the word “ganache” actually means idiot. I covered the bowl with a dinner plate, dashed off to rehearsal, and tried not to think of the wasted effort. Good thing I had allowed myself an extra day before Opening Night to make them. The next morning, I was able (after gently heating the mass in the microwave for a couple of 30 second bursts, on half power), to warm it gently enough to get it to “relax” enough for me to roll into balls, which I then chilled. I then remade the whole ganache “she-bang” (as one character says in the play). This time, I was wise. After letting them sit at room temperature for an hour, I gently warmed 6 fluid ounces of frozen berries at half power in the microwave, until I could break them into tiny pieces, then stirred this into my 6 fluid ounces of heavy cream. I covered the mixture with a dinner plate, and left it to come to room temperature. 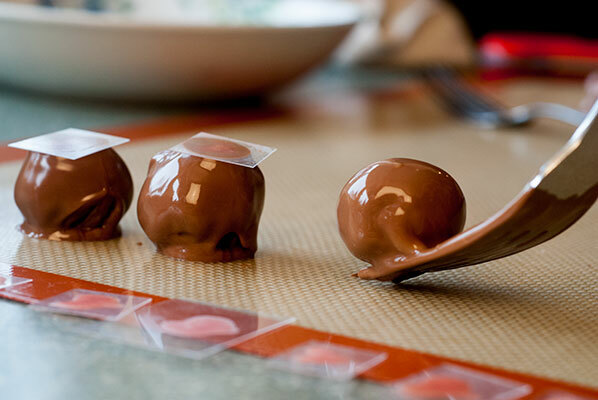 I gently heated the cream/raspberry mixture until small bubbles formed at the edge, and folded it into the chocolate in five additions, mixing avec beaucoup de friction, between each addition. I added in the room temperature unsalted butter (4 Tablespoons), ¼ teaspoon raspberry flavour and 1 teaspoon vanilla, blended … and sighed in happiness. 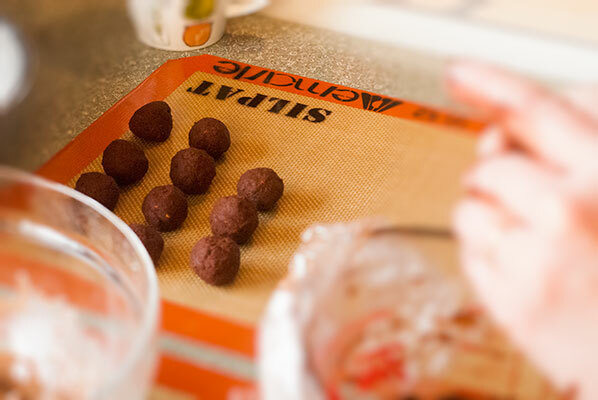 After leaving the ganache to come to room temperature, I chilled it slightly in the refrigerator, then rolled it into truffle balls. 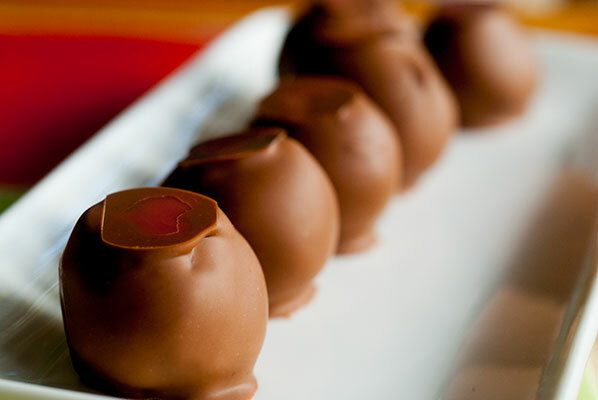 It is a beautiful thing to have a ganache come together perfectly. 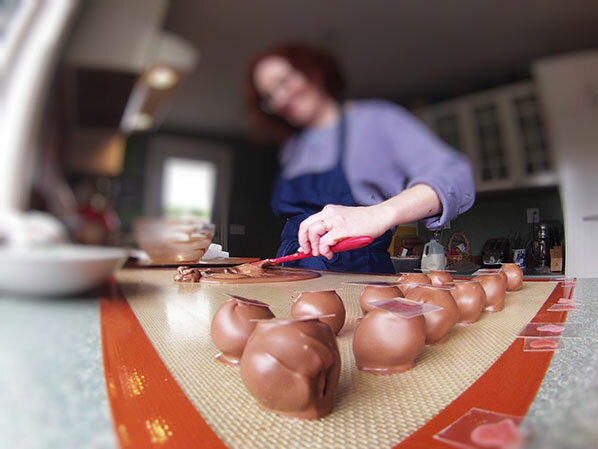 My confidence restored, I tempered the milk chocolate, enrobed the truffle centres, and topped each one with a tiny heart. Here’s how to make the transfer sheets. My darling partner made labels for the boxes and eh voila: Charlotte’s Raspberry Patch Truffles made their opening night appearance, after all. 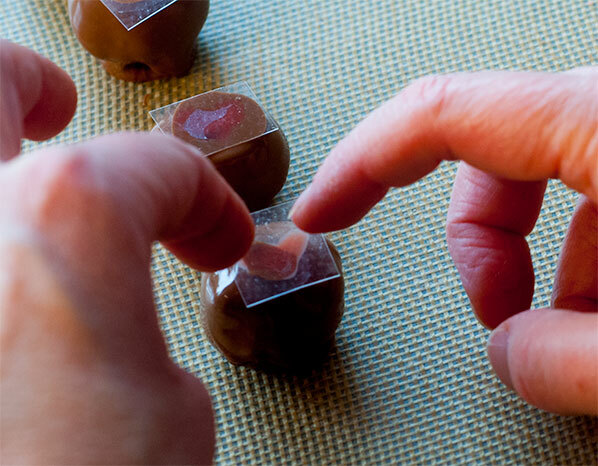 With the milk chocolate I had left, I enrobed my seized chilled truffle centres, and re-rolled them in grated chocolate to cover their many imperfections. These would become the “bottom of the box, night before closing, just gotta have something chocolate” goodies. They actually tasted really good, despite the grainy texture, and were wonderful to have in the fridge at the theatre for anyone who needed. Because, as my character in the play, Charlotte would say, “Lord Love a Duck – don’t throw that away-it’s good food”. And this sweet little mixture of chocolate and raspberry ganache certainly is.